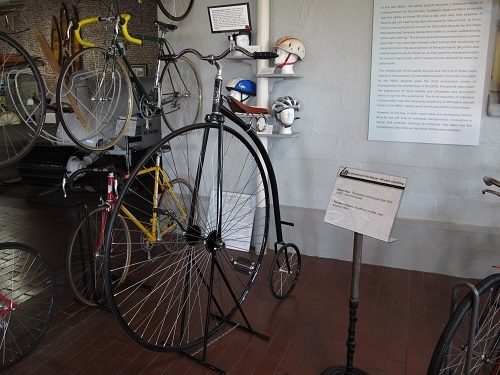 At first, this design was just called a Bicycle but when the Safety Bicycle made its debut, it became known as an Ordinary Bicycle. Later on, it was referred to as a High Wheeler or Penny Farthing- the latter name based on the relative size of two British coins made in the late 1800s. In its day it was quite fast, but the high center of gravity and short wheelbase made it prone to forward tip-overs, which became known as “taking a header”.